Estimated payment based on 6.99% APR for 96 months for well qualified buyers. Terms may vary. Hi, I am interested in your 1972 Chevrolet Other Chevrolet Models (stock #4684-ATL) listed on Autotrader for $38,995. I'd like to get more information about this vehicle and confirm its availability. Plenty of power to surmount even the more unforgiving of terrain, the promise of an exhilarating open air driving experience whenever you choose, plus a great look both inside and out. 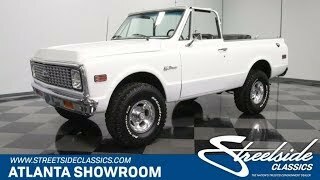 This 1972 Chevrolet K5 Blazer is one ultra-clean classic with an awful lot to offer and it all comes at a fair price for such a hard to find, well-restored SUV. While it was actually a late entry into the SUV competition of its day, it didnt take all that long for a first generation Blazer like this 72 to make up for lost time and eclipse its rivals in popularity. Its a stout, capable looking truck, which isnt really surprising, since Chevy had always intended the model for spirited use, even to the extent that when the K5 Blazer debuted, it was only offered in 4-wheel drive configuration. The fresh looking shade of white draped over this vintage workhorse really looks nice - even from up close - and its factory-correct exterior wears a collection of new chrome, emblems and trim to inject a vitality youll notice right away. The paint has a nice consistent texture with no notable flaws. The combination of all of that off-road prowess and open air versatility is plenty compelling, and for those occasions calling for more shelter, a manual convertible top is included and it looks very fresh, with clear tinted windows on its sides and back. The interior was refurbished from scratch and now features a sort of factory-plus appearance thats a perfect match for a classic SUV like this one. The front buckets and rear bench seat now wear snug-fitting black vinyl covers and sit over a very solid floor thats protected by a rhino-type liner for a look thats both rugged and practical while engaging in real world off-roading, with a pair of very sturdy rubber mats both in front and back. The sight of the manual shifter and the lever engaging the 4-wheel drive ability of this seldom-seen Chevy sitting side by side over such a ready for action backdrop is pretty hard to beat. The dash area is especially sharp, with a fresh black instrument panel holding a collection of clear gauges encircled by chrome rings that look like theyve just been installed, and a new dash pad running across the top. In back, the storage area is well-protected by that same liner, and an aftermarket speaker cabinet helps fill the interior with sound. Beneath the hood sits a 350 cubic inch V8 thats been armed with a 4 barrel Edelbrock carb and a mid-rise chrome intake manifold. Besides looking great with its assembly of chrome components, the engine provides plenty of power that youll really enjoy, whether you find yourself on the highway or on more rugged terrain and it sounds awesome as it exhales into its Hedman long tube headers leading out to a full 2- exhaust to serve ample notice of your arrival. The overall classic driving experience this Blazer offers is really outstanding - its 4-speed manual transmission is shifting smoothly, the clutch action is seamless and its 4-wheel drive engages without a hitch. Very clean 15 steel wheels outfitted with meaty 33x12.5x15 BF Goodrich All Terrain T/A radials finish this Blazer in just the right fashion while equipping it with plenty of gripping ability wherever it may find itself. Skillfully restored and running strong, this 1972 Chevrolet K5 Blazer offers a blend of vintage appeal and off-road prowess you dont often find. Call today!